Gorgeous card Lynn, you do fabulous CAS cards! This is so lovely. A great \CAS card. The tree is stately and I love the way you overlapped the red ink for the sentiment. I must remember to use some other colours of ink...I am quite boring and always reach for my black or brown! 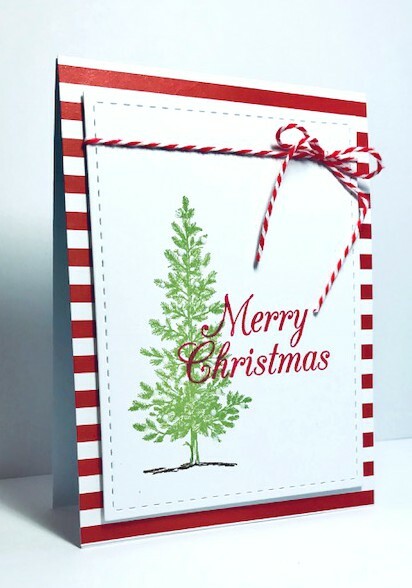 Super CAS card, great design and love the red and white with the lovely green tree. Beautiful CAS card for Rudolph Days, Lynn! I always enjoy the traditional colors the most! What a gorgeous card Lynn! I love the striped paper and matching twine, love how you stamped the sentiment over the tree too, great design! Just lovely! I love your ability to pull out a punch with a card, CAS and all. Love the layout and your striped DP! This is probably my all time favorite tree! It looks wonderful with the red! I hope we can both stay on track with those Christmas cards! Hmmm, I think I said something about doing one or two Christmas cards each month back at New Year's and I haven't done a single one. Are you trying to inspire me or just give me a guilt trip? lol Fab card, Lynn, and I love the stripes! The twine is so perfect and I love how you stamped the sentiment right over the tree. Perfect Lynn..in my early days of stamping and stuff this was my favourite tree..I stamped it so much and now he rests in the bottom drawer with other stampin up stamps and I really should get him out..thank you for the memory and inspiration.. I love your clean and simple style of making cards! Nothing is ever over-done, and everything is always fabulous! What I like most about this card is that you stamped the sentiment right into the tree and it looks so cool that way! Awesome card! This is stunning - just love your design. I am with Carol. I just can not pull CAS off, most times. You amaze me. This is so cool. Lynn, the tree on this stunning card is gorgeous. This part is just so bright and clean and pretty! I am trying to make Christmas cards this year too. A beautiful CAS card, and a beautiful tree as well. The striped background and matching twine look great too. Such a pretty tree here and the red and white striped paper looks awesome. Lovely Christmas card, Lynn. This is one of my all-time favorite SU sets! !